An art exhibition on loan from the US about the Irish Famine has opened for the first time in Northern Ireland. 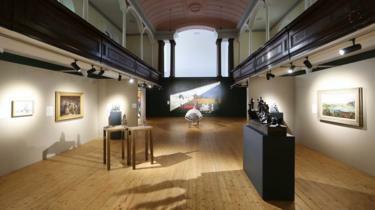 The exhibition, 'Coming Home: Art and the Great Hunger', will be in Londonderry until 16 March. 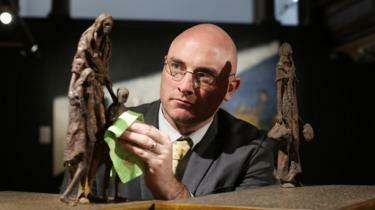 It is on loan from Ireland's Great Hunger Museum at Connecticut's Quinnipiac University. About a million people died of starvation and epidemic disease between 1845 and 1851, and some two million emigrated. Ireland had witnessed a massive surge in population from 2.6 million to 8.5 million by 1845 when blight struck the potato. Few places on the island escaped its effects. Local historian Ken McCormack told BBC News NI that people moved to Derry from Donegal for a better life. "They quickly found out that things were not great here either," Mr McCormack says. "The blight didn't hit us as such, but the amount of people coming to the north west was certainly problematic and workhouses didn't like it." Mr McCormack also says a famine wall from Culmore to the roundabout at the bottom of Strand Road was built. "This was to create a boundary," he adds. "Landowners benefited from famine walls. They didn't want to give anybody any of their space for free." The exhibition, which features more than 50 pieces of artwork by Irish artists, has been touring the Republic of Ireland for 12 months and has been viewed by more than 90,000 people at Dublin Castle and at the West Cork Arts Centre in Skibbereen. 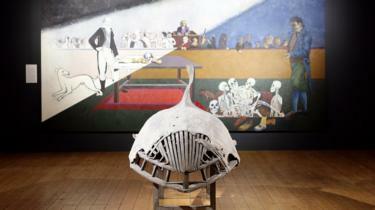 It will be on show at Derry's Cultúrlann uí Chanáin. The pieces of artwork on view are from Jack B Yeats, Dorothy Cross, Paul Henry, William Crozier, John Behan, Brian Maguire, Rowan Gillespie, Micheal Farrell, Hughie O'Donoghue and Alanna O'Kelly. Ryan Mahoney, director of Ireland's Great Hunger Museum, says it was always the ambition of Quinnipiac University to bring the exhibition to both parts of the island. "We hand selected Cultúrlann due to its commitment to culture and the arts and its ambition to become Derry's new creative quarter," he says. "In 1847, over 12,000 emigrants left the port here in Derry. It was important for the university to acknowledge the impact the great hunger had locally." The mayor of Derry City and Strabane District Council, John Boyle, said: "This exhibition is a huge coup for the city and north west region. "It will put the city on the international stage."